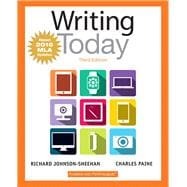 Writing Today , 3rd Edition introduces individuals to the conventions of writing memoirs, profiles, literary analyses, arguments, research papers, and more. Each chapter features a step-by-step process for composing within a given genre, as well as exemplary professional readings to promote rhetorical knowledge and critical analysis. The 42 short chapters, the chunked writing style, and visual instruction work to ensure that individuals will transfer the skills and strategies practiced to their lives and careers. From its graphic “Quick Start Guides” to its “Write This” prompts, Writing Today challenges individuals to extend the boundaries of their writing abilities as they practice composing for the real world. Richard Johnson-Sheehan is a Professor of Rhetoric and Composition at Purdue University, where he is the Director of the Purdue Writing Lab. He has also directed the Introductory Composition program (ICaP) and mentored new teachers of composition for many years. He teaches a variety of courses in composition, professional writing, and writing program administration, as well as classical rhetoric and the rhetoric of science. He has published widely in these areas. His books on writing include Writing Today, now in its third edition and co-authored with Charles Paine; Technical Communication Today, now in its fifth edition; and Technical Communication Strategies for Today and Writing Proposals, now in their second editions. Professor Johnson-Sheehan was awarded 2008 Fellow of the Association of Teachers of Technical Writing and has been an officer in the Council for Writing Program Administrators. Charles Paine is a Professor of English at the University of New Mexico, where he teaches undergraduate courses in first-year, intermediate, and professional writing as well as graduate courses in writing pedagogy, the history of rhetoric and composition, and other areas. At UNM, he directed the Rhetoric and Writing Program and the First-Year Writing Program. He is an active member of the Council of Writing Program Administrators and currently serves on its Executive Board. He co-founded and coordinates the Consortium for the Study of Writing in College, a joint effort of the National Survey of Student Engagement and the Council of Writing Program Administrators. The Consortium conducts general research into the ways that undergraduate writing can lead to enhanced learning, engagement, and other gains related to student success. He is a co-author with Richard Johnson-Sheehan of Argument Today. NOTE: Both Brief and Comprehensive Tables of Contents follow. Topic: What Am I Writing About? Angle: What Is New About the Topic? What Has Changed to Make This Topic Interesting Right Now? What Unique Experiences, Expertise, or Knowledge Do I Have About This Topic? Purpose: What Should I Accomplish? Where Will They Be Reading? When Will They Be Reading? Why Will They Be Reading? How Will They Be Reading? What Is Their Attitude Toward You and the Issue? Researching: What Background Do You Need? Is the Source Up to Date? How Biased Are the Author and the Publisher? Can You Verify the Evidence in the Source?